Thought I'd share some of my favorite accessories that I spotted in May. Three are flower necklaces, so I'm going to say that's a trend for Spring/Summer 2014. 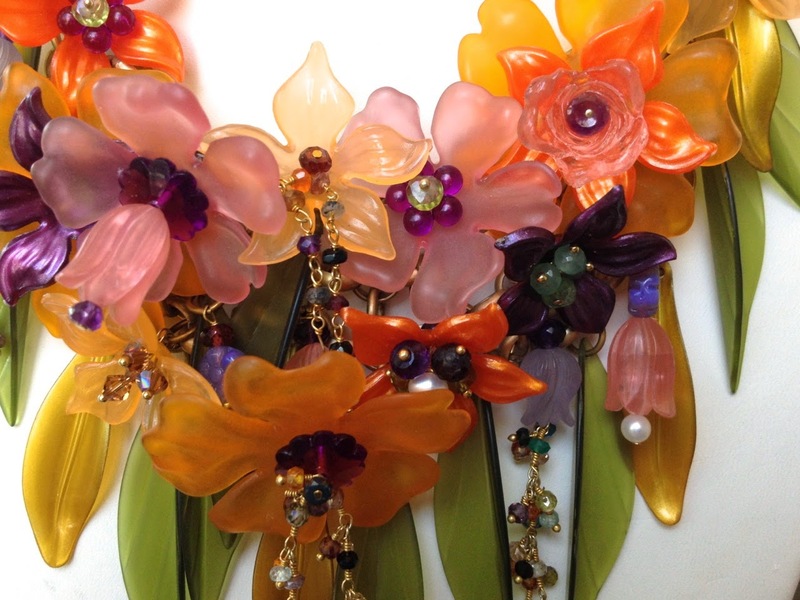 This gorgeous flower necklace was made by jewelry designer Wendy Neuss using vintage lucite flowers and leaves, semi-precious gemstones and rosary chain. It is a prototype and Wendy is planning to do a limited line of one of a kind pieces that mix vintage lucite and semi-precious stones. I originally did a blog post on Wendy's jewelry in Dec (https://www.blogger.com/blogger.g?blogID=8964687418584150380#editor/target=post;postID=168526997716006443;onPublishedMenu=allposts;onClosedMenu=allposts;postNum=30;src=postname) that featured many pieces in her current collection. For information about the jewelry Wendy can be reached at wneuss@gmail.com. 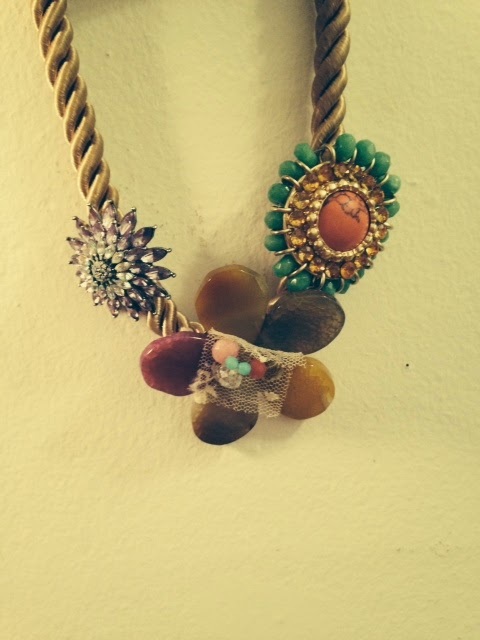 Oscar de la Renta made some flower jewelry this Spring including this beautiful necklace made of resin and enamel. I was hosting a table at a charity luncheon and a friend of mine walked in wearing an amazing outfit in shades of yellow that she had put together. It was a perfect backdrop for this statement necklace. I don't think the photo does it justice, but trust me it was really pretty when she had it on. 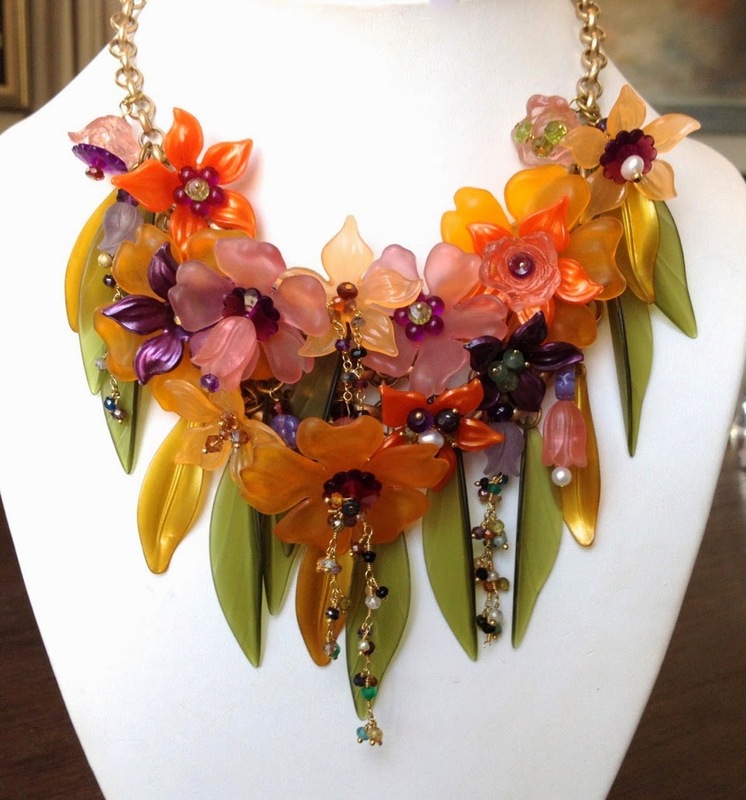 It's from Anthropologie and if you Google "Anthropologie flower necklace" you can find a better image. I saw this necklace in TJ Maxx and thought it had an Indian look. I love all the colors. Obviously this is for a special occasion and makes a big impact. It's by a company called Natasha. My friend, Joyce Brooks, the Editor-in-Chief of Black Tie International Magazine, gave me this fabulous headpiece, because she knows how much I love hats and fascinators. It's a cross between a fascinator and a headband and I just love it. The patriotic colors are fun and I think it's great for summer. And, finally, I "rediscovered" this bag in my closet and pulled it out to carry to a charity luncheon. It's by a company called Asia Bellucci, made in Italy, and I got it at TJ Maxx. I know absolutely nothing about the company, but I love the shape and the leopard print, which I'm also a fan of in bags. The reverse side is black patent leather.